Is there a better food combination like chicken and waffles? Maybe, but not too many that are as sinfully decadent. With the sweet fluffy taste of the waffle contrasted with the savory, crispy fried chicken, just the thought of this dish will make anybody’s mouth water! If you haven’t had the pleasure of trying this delectable treat, you owe it to yourself to find a place that serves up a good plate of the stuff. 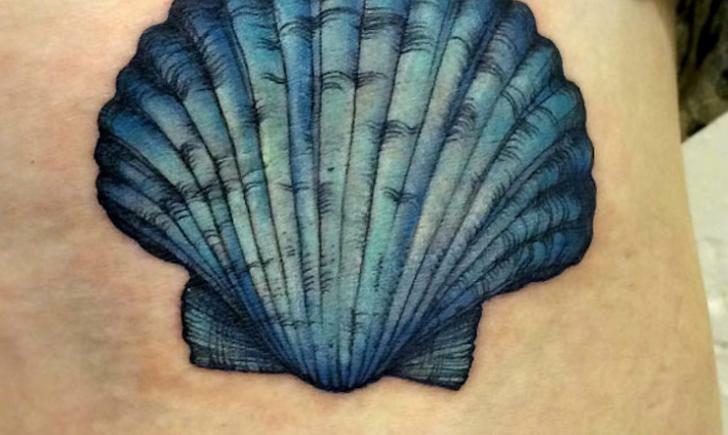 Some people love it so much that they’ve decided to get a tattoo to show how much they can’t live without it! 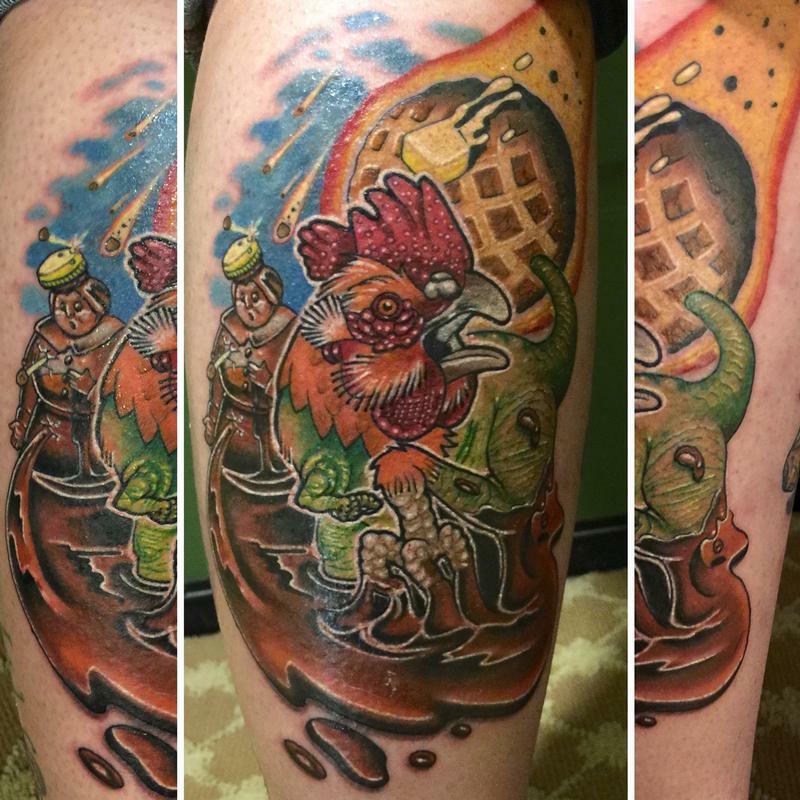 Whether you’d consider getting a tattoo to show your love for chicken and waffles, or just chicken, or just waffles, you can still appreciate the commitment and love that these tattoo enthusiasts have for their food! 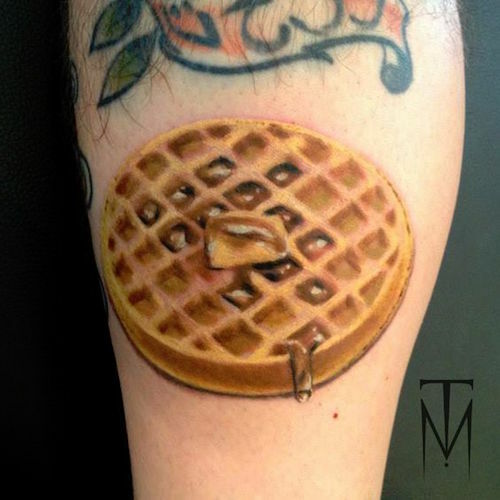 Check out the following 10 tastiest chicken and waffle tattoos and try not to get too hungry! 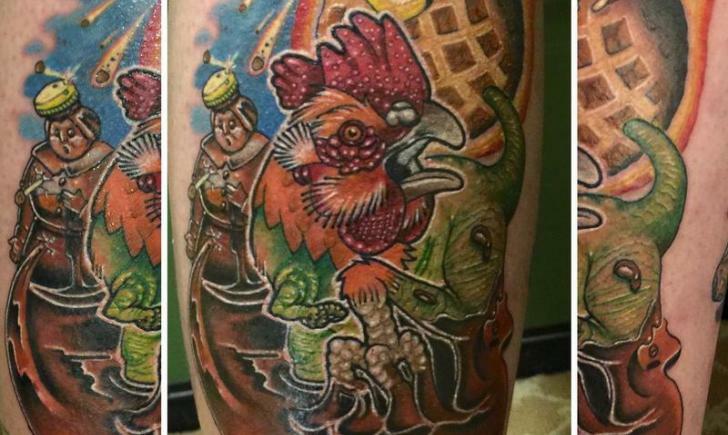 This new school composition of chicken and waffles is perhaps less appetizing and more fun and messy! 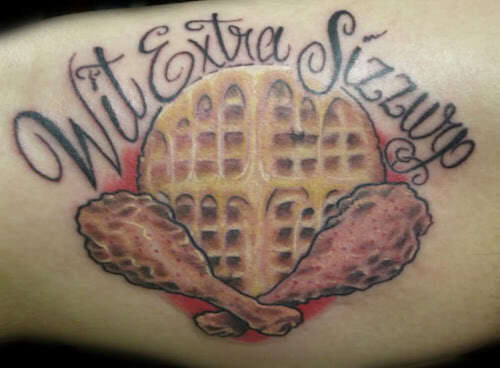 “Wit Extra Sizzurp” is the words atop this delectable waffle dripping with syrup, with two fried drumsticks at the base. 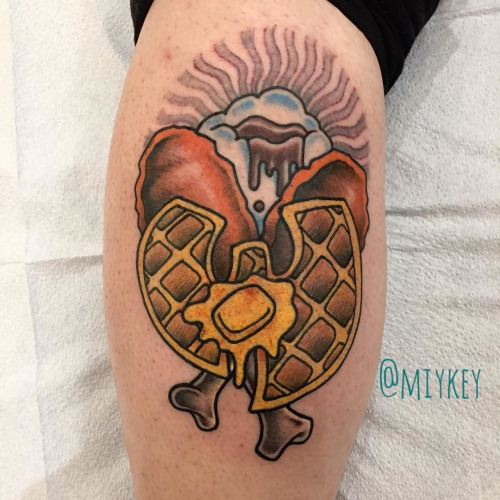 This gorgeous Wu-Tang waffle ain’t nothing to…well anyway, it looks delicious with melted butter and drumsticks behind it. Although, I can’t say I know what that mountain behind it is made up of. Any guesses? Even celebrities love chicken and waffles! 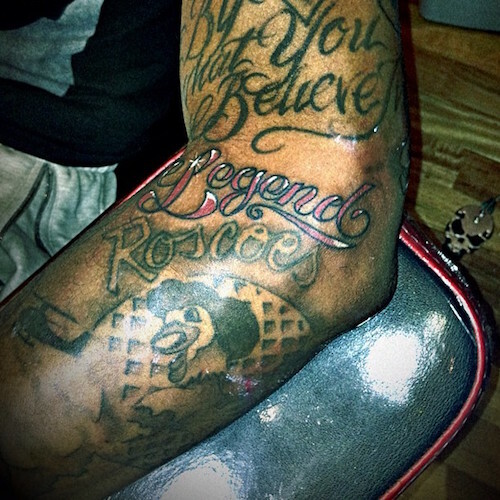 Brandon Jennings got this to show his love for an especially famous chicken and waffles restaurant, Roscoes! That drop of syrup looks so delicious. 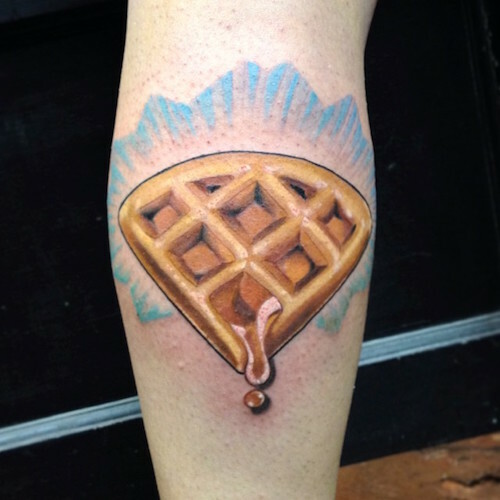 More realistic waffles to make you hungry! 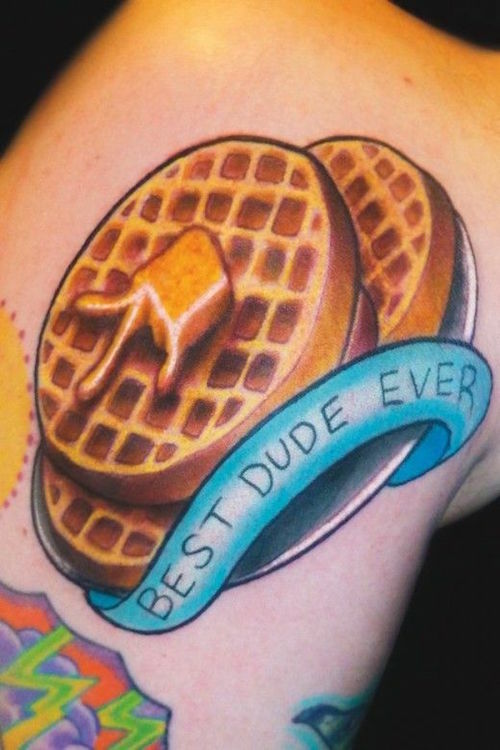 Not sure what the significance of the words “BEST DUDE EVER” are on this plate of waffles, but it’s got to be delicious! 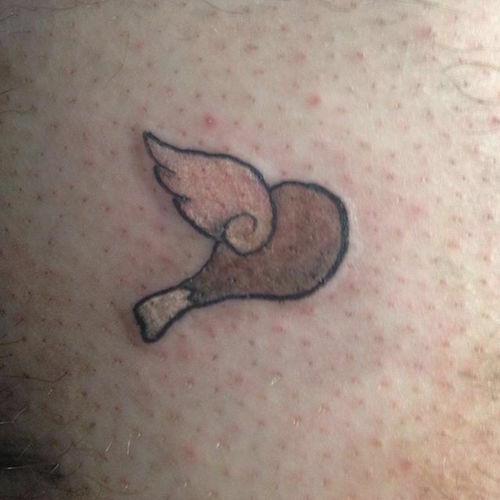 It’s as if the tattoo artist couldn’t control themselves and had to take a bite of this drumstick! 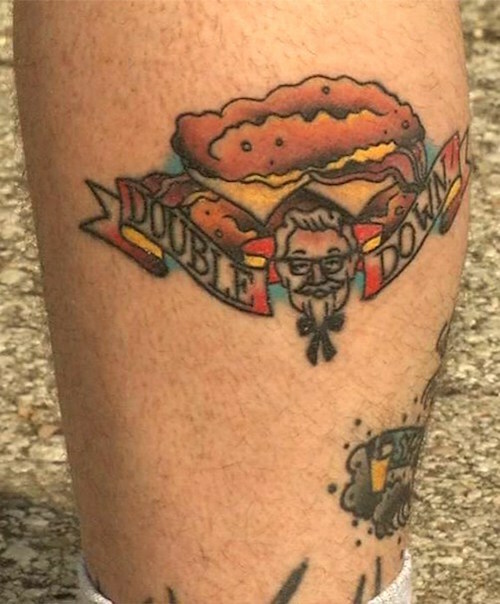 Last of all, this tattoo wearer got a tattoo tribute to the famous and infamous “Double Down” sandwich at KFC, which used big pieces of fried chicken as the bread. 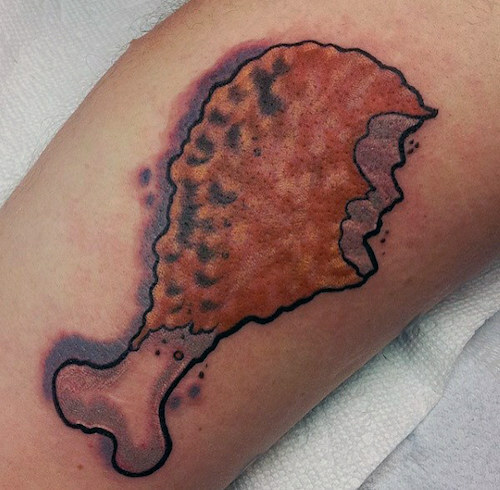 Not quite chicken and waffles, but chicken in an unusual way!